The hotel trades with a 3 star accolade from Visit Scotland and although trades very well offers huge potential to take further utilising the size of the overall plot in more detail and expanding on not just the main hotel but within the 12 acres. Options such as eco lodges, self-catering, stables and residential developments have all been considered ready to be explored further as well as internal ideas such as expansion of the kitchen into an extension which would allow for the owners to cater for more covers and make it ideal for a chef operator looking to stamp there mark. In terms of the local, passing and repeat business it is supported very well and during the summer months House O Hill Hotel is recommended by many other local businesses in the surrounding area such as B&B’s, self-catering and Glentrool Caravan Park as the place to wine and dine. The hotel fully caters for the outdoor enthusiast due to its superb location at the Southern Upland Way and the 7 Stanes Trails. Located to the rear of the hotel is a very well presented self-contained flat which comprises of 2 bedrooms, lounge/kitchen dining area and bathroom, with private access to the back. Curleywee Cottage is located next to the hotel and is attached to another cottage which is not owned by the hotel. Completely refurbished to a very high standard in January 2011 (previously used as owner’s accommodation) with marketing commencing March 2011. Since it was established it has become very popular with guests looking to explore the area and come and go as they please. Comprising of 2 bedrooms (single and double), walk in shower room with toilet, open plan living/ kitchen/dining area and ample storage. Further benefits include a private garden with small summer house and secure shed for bikes. This property is held on a separate title. Offers in the region of £70,000 are being sought. The House O Hill Hotel occupies an instantly recognisable roadside location within the pleasing hamlet of Bargrennan on the edge of the Galloway Forest Park near Glentrool in Dumfries and Galloway. The hotels location is second to none for the outdoor enthusiast and offers an abundance of activities, walks and historical sites such as Glentrool Forest Visitor Centre and Loch Trool which is overlooked by “Bruce’s Stone”, a monument to Robert the Bruce commemorating his victory over the Earl of Northampton in 1307. Galloway Forest Park is the UKs first designated Dark Sky Park outside North America and is ideal for astronomers due to having very low light pollution. With the largest area of forest and attracts visitors throughout the year who come to experience what is on offer including the world class 7 Stanes mountain bike trails and the miles of open walking trails for all abilities. The Merrick, which is Southern Scotland’s highest mountain at nearly 2,800ft can be climbed from here also. Close by too is the Southern Upland Way, a 212 mile coast to coast walk which passes only a few hundred yards from the hotel, making it an ideal stop off point for refreshments along the way. On a whole the area is an outdoors paradise with activities to suit all tastes. A host of local amenities are available in Newton Stewart including schools, supermarkets, pubs, restaurants, shops, leisure centre with swimming pool and services. From Glasgow take A77 Ayr road following the A714 to Newton Stewart. Once in Bargrennan turn into Glentrool, the hotel is 100yds on the left. The hotel was bought in January 2010 and underwent a complete refurbishment including double glazing throughout, fully insulated and extensive internal and external decoration, opening for trading in March 2010. The property is presented very well and is in “walk in” condition. All public areas within the hotel are accessed via the main entrance into a bright and welcoming hallway. Located to the right hand side, this bright and pleasing room is presented in a fairly modern style with a traditional twist incorporating exposed wooden floorboards and open feature fireplace, with varying seating/dining arrangements. This room leads directly into the function room. Previously not really used, the current owners have transformed this once unloved area of the hotel into a useful addition to the public areas and a space that has worked well as part of the businesses growth. Accessed directly from the lounge/breakfast room it works well for small functions, parties and private dining with the lounge area acting as additional space if required. The room is very bright incorporating windows along the roadside and again fitted to a fairly modern style with a traditional twist similar to that of the lounge/breakfast room. Situated to the left of the main hallway, this pleasing bright room is located to the front of the hotel and again carries the same theme through from the other areas, incorporating many similar features including traditional wooden and slate flooring. To the back is a well-proportioned bar giving access to the kitchen. This room leads directly into the lounge bar. Again presented to an exacting standard befitting that of the hotels public areas with traditional wooden flooring and an exposed stone feature wall housing a log burning stove. 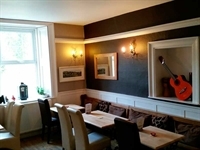 This is an ideal room to sit and relax with a drink or dine and also gives direct access to the beer garden at the side. The hotel currently trades with 2 letting bedrooms, located on the first floor which have been recently refurbished 2013 to a high standard. 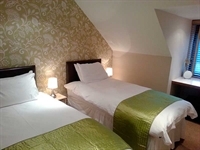 Each room has en suite facilities and can be configured to double, twin, triple, or single depending on requirement. The property offers extensive grounds to the rear comprising circa 12 acres and the owners have looked into various development opportunities which have been greatly received by the local planning authorities (details can be fully discussed during viewing). This is a main area of development and growth for the hotel going forward and should be considered by any new owner. The Current owners have submitted a pre- planning application for an Eco-Pod site along with a pre-planning application for another residential dwelling. There is also a static caravan (currently used for storage) and a large garage/storage facility, also to the rear.